Tired of the aching back pain of raking or walking around with a handheld blower? 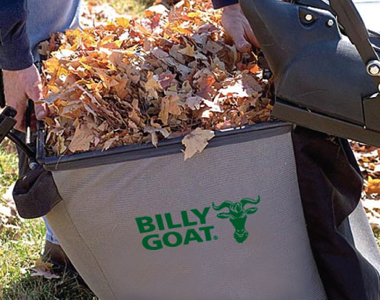 This Billy Goat MV650H Lawn Vacuum uses a 6-blade impeller to chop up cans, bottles, litter, mulch, and other debris in less time. Gobble up the debris with the 29 inch gobbler door that can be adjusted to suction up a lot of leaves, or a concentrated opening for smaller debris. Gather everything up in the 50 gallon zipperless mesh bag with the best in class unloading/loading for less down time. And, 14 inch tires carry this vacuum over rough terrain and soft, thick surfaces. Honda Engine: Pick up debris with ease and move through your lawn quickly with the 187cc Honda engine. 29" Gobbler Door: The 29 inch gobbler door can be adjusted from the operators position for vacuum control. Open the door wide to suction up a lot of leaves, or slightly close the opening for smaller debris. Adjustable Height Control: Adjust the vacuum height control with a simple hand crank located below the operator’s position for vacuum difference between hard surfaces and thick grass. 6 Blade Impeller: The 6-blade impeller chop up cans, bottles, grass clippings, litter, mulch, and other debris to be sent to the zipperless bag. Surfaces: Larger properties, commercial lots, leaf cleanup, rentals, parks, city streets, and parking lots. Zipperless Mesh Bag;Fill this 50 gallon mesh zipperless bag to the top before emptying for reduced down time and less unloading trips. The best in class loading/unloading ability allows you to slide this bag in and out on rails to reduce back pain. 14 inch Wheels: These tires are large to reduce rolling resistance to make it easier to maneuver around thick turf, hilly areas, and hard surfaces with ease. Low Composite Housing: The low composite housing reduces weight and won’t rust or dent for guaranteed durability and easier maneuvering. Warranty: Feel reassured while vacuuming up debris and leaves with the 2 year residential warranty and a 2 year commercial warranty. Operator's Manual: Billy Goat MV650H Manual / Parts List. 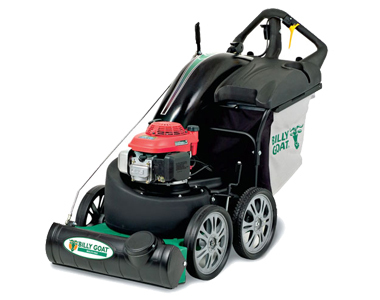 Ask us about the Billy Goat MV650H 187cc (Honda) Commercial Push Leaf & Litter Vacuum . Please no repair questions. Your Q&A may be posted to MowersAtJacks.com to help other shoppers, like you, with their purchasing decisions. Thank you. Robert, the Billy Goat MV650H has a 4-stroke Honda engine. Steve, the MV650H is push only, not self-propelled. The MV650SPH is the self-propelled version of this model. Is this the right model or my best option for sweeping fine dust and particles off of a smooth concrete floor in a wood shop environment? Mark, yes the Billy Goat MV650H can be used to on hard surfaces like concrete. If it's in a dusty environment, I would suggest also purchasing the Dusk Sock KIt 840263 accessory to reduce the dust debris. Hosea, if you're having trouble starting the Billy Goat MV650H lawn vacuum, please refer to the Operator's Manual for recommended starting procedures. Ensure to place the throttle in CHOKE position. Then return to RUN position after started, to allow engine to reach operating speed. The shut off switch should be turned straight in-line with the fuel lines to allow fuel to flow, and perpendicular to the fuel line when shut off. 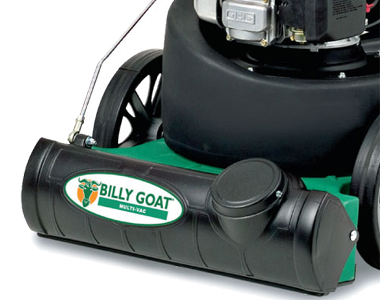 Add options now for your Billy Goat MV650H - Litter Vacuum at a 1 time discounted price. When you are ready to check out, just click the ADD TO CART button. Description: Attaches to the gobbler door. No extra plate is required to close off the air intake. Ideal for those hard to reach areas. Fits MV models.